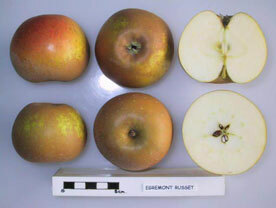 As the name suggests, Egremont Russet probably arose on the estate of Lord Egremont, Petworth. As Joan Morgan writes, “The gardens were famed for their fruit, particularly in the 1800s, when a number of new varieties were raised, but none bearing this name. Nevertheless, head gardener Fred Streeter always maintained it was raised at Petworth.” It was first recorded as a variety in 1872 by nurseryman J Scott of Somerset. Egremont Russet received an RHS Award of Garden Merit in 1993. It is currently cultivated as part of Brighton Permaculture Trust’s National Collection in Stanmer Park, Brighton. You can see an Egremont Russet apple tree (planted 2009) in Home Farm Orchard, Stanmer Park ( map). The Egremont Russet apple has a distinctive flavour, often described as nutty. Morton Shand said it recalled the scent of crushed ferns. An almost smoky, tannic quality develops after keeping, and the flesh becomes drier. The distinctive fruit is russet with a slight orange flush and a gold background colour. A medium sized apple, it is flat round in shape. Size medium. Shape flat round. Basin broad, quite deep. Eye large, open; sepals broad based; quite downy. Cavity narrow, shallow; lined russet. The stalk is very short and quite thin. Creamy flesh. The fruit can be picked in early October and stored until December. The Egremont Russet is a moderately vigorous tree. The Egremont Russet is resistant to scab and canker, though prone to bitter pit.